Clarins Liquid Bronze is a self tanning product designed for use on the face and décolletage to give those areas a natural looking tan that is often hard to achieve with standard fake tans. I have to say this was the product I was most excited to try as I hear nothing but good things about it and facial tanning is something I've always struggled with. I'm often left with a case of tanned body and white face after a fake tanning session as using fake tan on my face seems to emphasise any dry patches or imperfections which isn't a great look. Does this happen to anyone else? With this being said, I was hoping the liquid bronze self tan would come to the rescue and give my face that sun kissed glow I've been longing for. I've been applying this to my face, neck and chest area with a cotton pad before going to bed and allowing it to work its magic over night. When I wake up the morning, my face looks naturally tanned and radiant. What I love most about this product is that it doesn't look like fake tan at all, quite the opposite in fact. Even after one application it gives my face a tanned glow much like one I'd get naturally on holiday. You can apply it as often as you'd like too depending on how deep you'd like the tan but I find one or two applications does the job for me as I'm naturally quite pale and don't want to go too OTT with the tan. As well as being a little bottle of liquid sunshine, this stuff is a joy to use as it sinks into the skin straight away, leaves no sticky residue behind and smells incredible. Even my boyfriend commented on how nice I smelt after slathering this all over my face. If you haven't tried this product and struggle with facial tanning, I can't recommend it enough. When this bottle runs out I'll 100% repurchase. I LOVE IT! Clarins beauty flash balm would have to be their most iconic product and one that instantly pops to my mind when I think of the brand. Described as "the ultimate pick me up for tired skin", Clarins claims this will moisturise, brighten and tighten facial contours to ensure skin looks rested and relaxed. Do I agree with these claims? I'm undecided. This is the only product of all three that I'm a little unsure about. Don't get me wrong, its a lovely product to use and I do find it moisturising and a nice base for makeup, but is it as amazing as I thought it would be? No, it isn't. I don't notice any additional glow or radiance after using this product and although it does seem to 'tighten' my skin and help my makeup last longer, it doesn't make enough difference to my skin or the overall appearance of my makeup to warrant a rave review. What I'm trying to say is, I can take or leave this product. Its a nice treat to use on a night out or for a special occasion but it isn't something I feel I need in my makeup routine. Ever since the Clarins Instant Light Lip Perfectors (wow, what a mouthful) were released, they've taken the beauty world by storm. Every blog post I've read about them has been full of praise so I couldn't wait to try one for myself. Firstly, I love the packaging. There's something very elegant and pretty about it and I love that the product is dispensed from a sponge doe-foot applicator as it feels silky soft on the lips and makes application a very pleasurable experience (okay, that sounds weird but you know what I mean). The shade I was sent is 'Candy Shimmer', a soft peachy pink which is perfect worn on its own for a subtle every day look or layered on top of a lipstick for a more intense effect. Now although its called candy 'shimmer', there's no shimmer apparent and it has more of a creamy gel type consistency. It isn't sticky either which again means its great for every day use. After all, there's nothing worse than super sticky lip products that when combined with wind result in a mouthful of hair, ew! Other than being a lovely every day lip product, I also love how moisturising it is too. The Shea Butter and Wild Mango ingredients help to repair and soften the lips and when I'm wearing it I feel like I'm wearing lip balm as apposed to a lipgloss. This definitely gets a big thumbs up from me and my only criticism would be the price. If they're weren't so pricey, I'd be buying them all! 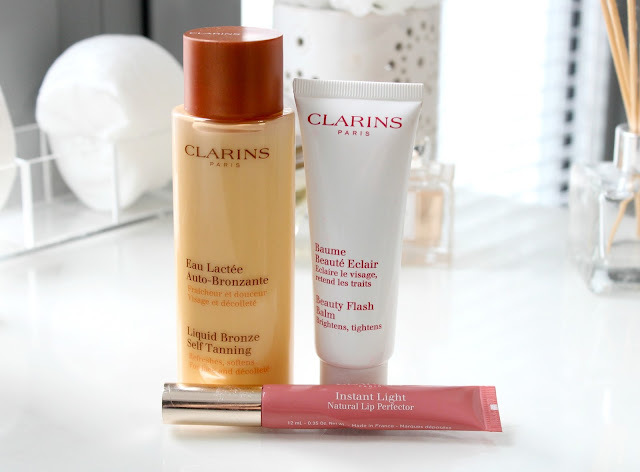 Have you tried any of these Clarins products? They can all be found online via various stockists. I've never used Clarins! May have to look into it at some point. 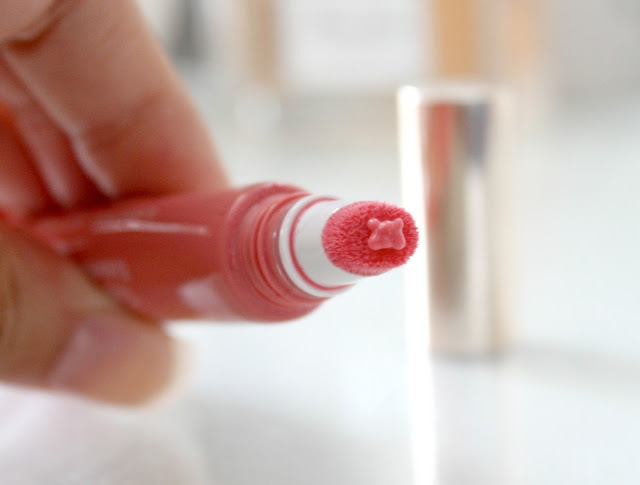 Ahhh I really want to try the Lip Perfector! I adore the Beauty Flash Balm, works really well at making makeup look flawless. I want to try all three! I've always gone with Clinique, but might invest in one of these next time I need to replenish! I'd love to try the Beauty Flash Balm one day! Thanks for the great review! I have both the liquid bronze and beauty flash balm which have both featured on my blog! Im totally obsessed with the beauty flash balm it just leaves my make-up looking fabulous! I must try some more products! Love the colour of the lip gloss! I like the look of the liquid bronze self tanning - very tempting indeed :) Thanks for this. I have a sample of the lip perfecters and loved them but wasn't sure whether to splurge out on them! After reading this review you have persuaded me! I'll be following this blog for your beauty secrets from now on! I am very interested in the self-tanner. I've tried the lip perfector and I was not that impressed honestly. Sooo tempted with the lip perfector! 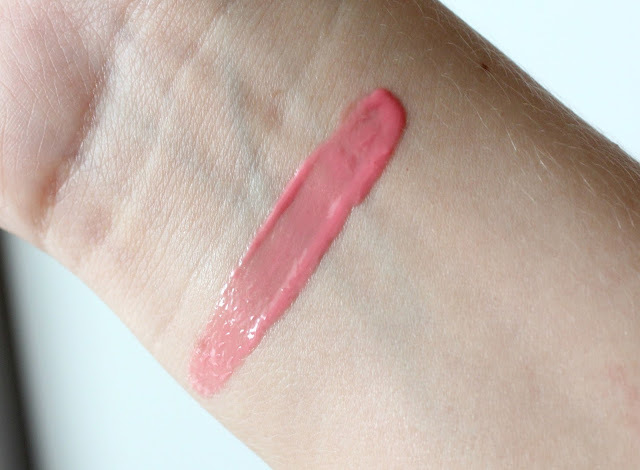 Ive had my eye on the No7 BB lips for a while too - they look quite similar in shade so might look into this one as well! Great post! Liquid bronze sounds heavenly! I am a big Clarins fan but I feel the same as you about Beauty Flash Balm. But you should try it as a mask.... 5-10 mins then wipe off with a damp facecloth. It's really brightening and makes the complexion look clear, fresh and bright. I cant wait to try the perfecting lip gloss. It looks incredible!!!! Loveeeee this post and this blog!!! 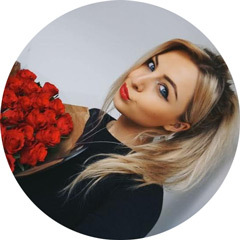 Its going to be my new go to site for beauty! !